Like most of us, I’ve never been very good at keeping New Year’s resolutions. You know what they say about good intentions, right? Eventually, I just stopped making them. Why set myself up for failure? Not the best approach, I know! Then I read a book that completely changed that approach…and my success. One Word That Will Change Your Life by Jon Gordon, Dan Britton and Jimmy Page walks the reader through a series of questions, reflections and activities that will take a vague list of goals and boil them down to one focus word. One word that has real meaning. One word that I won’t forget. One word that becomes central to my decisions, actions and choices through the year. One word I can commit to. Each year, there were real changes as a result of my one word selection and emphasis. In 2014 my one word was DOING. In 2015 it was BRAVE. In 2016 it was COMMIT. In 2017 it was AUTHENTICITY. For 2018, my #OneWord is HEALTHY. As in healthy living; healthy body, healthy mind, and healthy spirit. Last year, as I looked forward to my 60th birthday, I tried to make a lot of changes to hit that December milestone better than I was in January. In some ways, I succeeded. In others, not so much! As my birthday and year end approached, I realized that to make real changes, I needed to make healthy living a priority. And the best way for me to do that is to make “healthy” my one word for 2018. The last few weeks have been spent on some preparation. 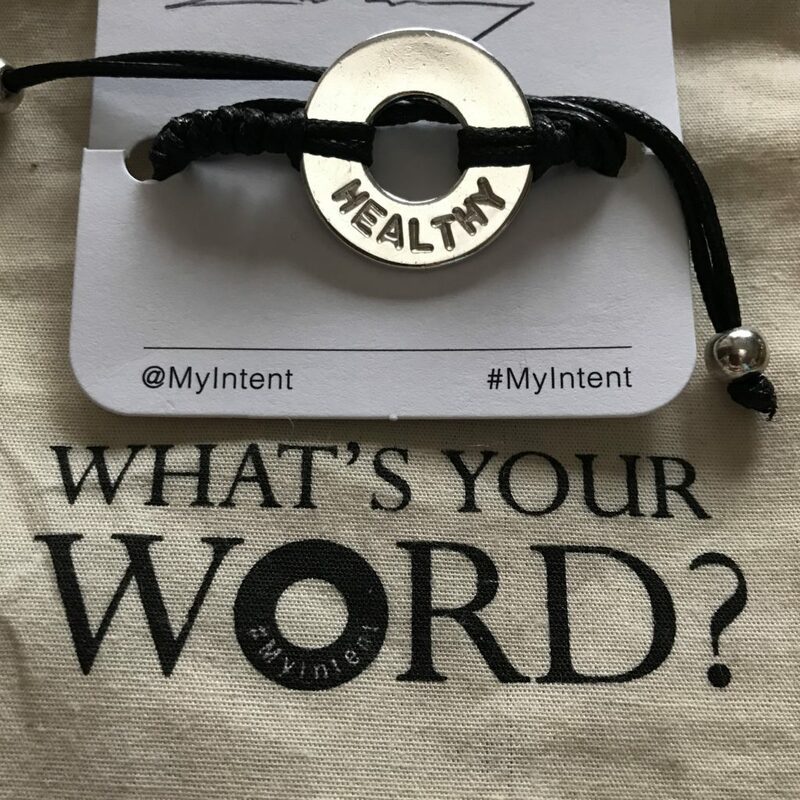 I’ve ordered a new “My Intent” bracelet to serve as my constant visual reminder of my one word (see photo). I ordered the colon cancer Bravelet and the Alzheimer’s Rivet Revolution band, both also serving as constant visuals of what my parents were diagnosed with at the same age I am now. Yes, Dad was diagnosed with colon cancer at 60 years and Mom was diagnosed with Alzheimer’s at 60 years. I turned 60 three weeks ago. For healthy body… I joined the local community center to get back into river walking and for indoor track access. Santa brought me the Gear Fit2 Pro to track my steps (and other metrics), even in the water. New SkullCandy wireless earbuds were in my Christmas stocking; I like to listen to CNN while walking. I had a colonoscopy a couple weeks ago so already know I’m starting the year with a healthy colon (If you’re over 50 and/or have a family history of colon cancer, contact your doctor to get scheduled!). I have an annual physical scheduled for mid-January and will get updated biometrics to help bring focus to improving and maintaining my overall health. For healthy mind… I’ve enrolled in the seven month long World Business & Executive Coach Summit (WBECS) Narrative Coaching certification program. I am so excited about the learning and how this will help move my coaching clients forward. This week, I also signed up for Photocritic, an online photography school that will challenge and inspire me all year long. I know that keeping my brain active and challenged is good for overall mental health and physical brain health. For healthy spirit… I’m going to continue my efforts to be fully present, to dwell in gratitude, to show up as my authentic self, and work toward peaceful living. There are a couple specific activities I’m thinking about, we’ll see what happens as the year progresses. I also know that all the preparation, gadgets and forethought in the world won’t take the place of commitment. So, here we go. What about you? Do you have a 2018 #OneWord? Or, do you have resolutions to keep? Let’s hold each other accountable and make 2018 our best year yet! Happy, healthy, New Year to us!